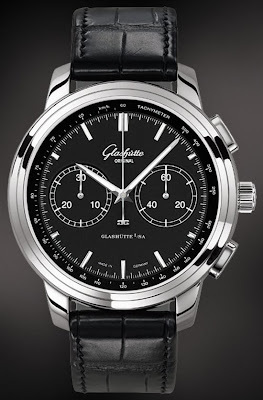 "The Senator Chronograph XL by the Glashütte Original manufactory in Saxony has grown considerably. In place of the Senator models’ usual 40 mm case size, this contemporary watch is now available in a handsome 44 mm stainless steel case. The careful case design featuring both polished and satin-finished elements sets off the matt black dial in a very favourable manner. A scratch-resistant sapphire crystal, antireflective on both sides, provides a generous view of the dial, whose design comprises modern elements such as the clearly contoured appliqués and the polished, luminous lance-shaped hands. The totalizers positioned at 3 and 9 o’clock provide visual balance. Both the chronograph’s second hand and the 30-minute counter can be easily seen on the dial of this well-designed timepiece, while another exciting detail around the perimeter is the additional tachymeter scale. The buttons positioned on the side of the case allow the wearer to easily operate the start, stop, and reset functions of the Senator Chronograph XL. Automatic manufacture Caliber 39-34 ensures reliable timekeeping precision for up to 40 hours without adding additional enery. This caliber is naturally complete with typical Glashütte design features such as the three-quarter plate, swan-neck fine adjustment, Glashütte ribbing and double sunburst decoration as well as a skeletonized rotor outfitted with a 21-karat gold rotor."